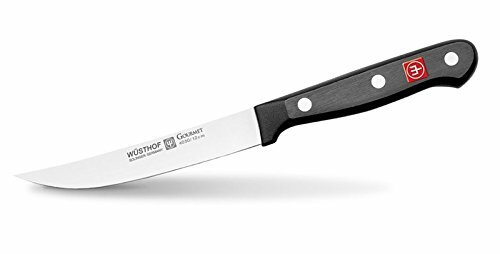 The Wusthof Gourmet- 8 Piece Steak Knife Set features precision stamped blades of high-carbon, no-stain steel. They have a full tang with triple riveted, durable Hostaform-C handles. The 4.5" blades are ground thin and precisely tapered from bolster to tip and from spine to edge for excellent sharpness and strength. Perfect for steaks, chops and any other meats. Made in Solingen, Germany and includes a manufacturer's lifetime limited warranty. Dishwasher safe, but hand washing is recommended.